CEO: "The market for carbon capture and storage is dead" | Watts Up With That? CEO: "The market for carbon capture and storage is dead"
Aker Clean Carbon's mobile test unit has been placed at Longannet Power Station in Scotland. But no full-scale project will see the light of day: The price tag is too high. 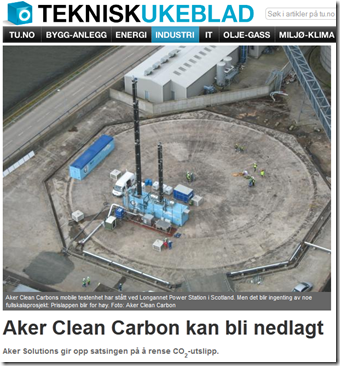 Photo: Aker Clean Carbon. 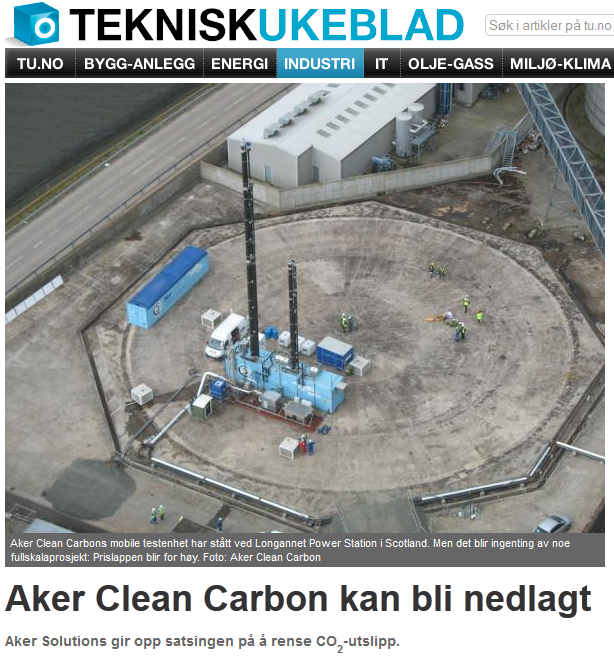 The Norwegian company Aker Clean Carbon may be closed. Its value is set to zero. The market for carbon capture and storage is dead according to their CEO. Article in today’s net edition of Norwegian Teknisk Ukeblad (Technological Weekly). This article brings important news especially damaging for the Norwegian politicians and believers in carbon capture and storage because Norway has put itself as the avant-garde of this totally useless technology and spent untold billions of dollars on it. The moon-landing that crashed that is referred to in the article refer to Norwegian prime minister Stoltenberg’s way of comparing the development of a technology for carbon capture and storage as equivalent to the US project of putting a man on the moon. The price tag of the Mongstad moonlanding project became too high and untold obstacles kept popping up continuously during the project until it crashed last year. Aker Solutions gives up efforts to clean CO2 emissions. The market for the company’s technology for capturing and storing CO2 is “dead”, according to chairman Øyvind Eriksen. He confirmed that the closure of Aker Clean Carbon is one of the options. – The market has disappeared for several reasons. It relies on support from public authorities. Today, the assumption of support from the government and the consensus among energy companies no longer exist. There is in reality no full-scale projects for the ACC to pursue, he tells “Dagens Næringsliv” (Norwegian financial newspaper, literally translated “Today’s Business”). The company has lost enormously because the so-called moon landing at Mongstad crash-landed. In addition, the British government decided to withdraw from plans for a full-scale project in Scotland: they were prepared to go in with one billion pounds in the project, but now, the operator Scottish Power believes that the bill will be closer to 13.5 billion. Then the costs became too high, and the authorities said no. In Aker Solutions’ accounting for the third quarter, which was presented on Thursday, the value of Aker Clean Carbon is written down to zero. Aker Solutions had an operating profit before depreciation of NOK 322 million in the third quarter, down from 733 million in the same period last year. The best way to “capture carbon” is to plant trees, cut them for lumber, “sequester” the lumber in houses and buildings, and plant more trees. There you go: “green” jobs that produce a product beneficial to mankind. Utter futility never will get in the way of the Australian Labor Party and their Global Carbon Capture and Storage Institute. At a mere $305,000,000 per annum, it is a drop in the bucket compared to our new carbon tax. Don’t count the watermelons out yet. There’s still a few well-funded idiots in government. LOL is the only appropriate reply. Even worse – it was the chairman of the board that said it! Should be OK for a “breed” like me to say this. Only thing better is a negative net worth for all Carbon Credits. You wanna dump some CO2? Simply order a billion kg of CO2 from Linde or Air Liquide at 5 USD or so a kg and bury it, what’s the problem. Print the money, get it delivered to a landfill, dump the bottles. Anyone can ‘capture carbon’ in their back yard and then, instead of getting credit for storing it, just sell it directly. It’s called fire wood. I often wonder what the opportunity cost of 25 years of AGW greenie policy madness would be. Globally something in the order of one trillion dollars has been devoted to windmills, carbon capture plans, solar panels, etc. If that money had been diverted to cancer research would we have cure? If CCS is dead, that pretty much means the future of coal is dead. Right? Oh yeah Fred. I usually think that about Communism – the enormous wastage of 70 years x millions of persons that believed it, brain power that could have much better use and i am not even counting for the damage that it made over the world just the uselessness of it all – , now i have to add the Warmists to the list. Lawrence Berkley National Labs did a ‘China 2050’ study earlier this year and concluded CCS was only marginally effective in reducing long terms emissions. It is actually quite tragic. First the different governments signs some paper, and suddenly there are billions availiable. New companys are born. Solar panels are made. Windmills are produced. Big visions about huge installations….and lots of new jobs in these companies. Then, after a while, reality sets in…..another paper is signed, and voila, all the billions stops coming….plants are shut down, visions gone, solar panels not produced anymore. Thousands of jobs gone in a flash. But the jobs should never have been there in the first place. If free marked forces are allowed to play, other products would have been made, like better nuclear power plants, better coal power plants, underwater turbines for maelstroms, more hydro dams ( in Norway, for example)., petrol made from coal, and so on, and so on…..thousands of jobs. But no, we cant have that. That is capitalism. So, in the end, I cannot do anything else but chuckle deep inside. Because it is so stupid, all of it. This is a good example that justifies why the UN is now saying we’re all getting poorer because of global warming. I guess I can exhale now. The time and money diverted and wasted by the AGW scam is the reason I believe someone should be held accountable – if not criminally, then financially. Al Gore is first on my list. I think we are getting to a point where an accounting of the total costs of all the research funds, mitigation funds, alternative high cost energy programs, exotic conference costs (interesting that they all go to the hot spas of the world to hyperventilate about nasty global warming) of this shameful quarter century of CO2 madness would be of value. Stack this enormous amount up against what might have been achieved. Is it more than the cost of eradicating malaria, HIV, cancer, a manned mission to Mars, clean air, waters and land, rescuing the world economy of which a measurable part of the problem has been these foolish expenditures …….? This accounting needs to be done, not just forgotten about in the euphoria of seeing an end to this CO2 nonsense. Also, the research millionaires (billionaires? ), the carbon sales, green energy sales millionaires. It’s also time to try to account for the value of the benefits of the higher CO2 levels – going by what is acceptable by climate science in accuracy and estimates, one shouldn’t be too daunted by the task. Meanwhile, Australia is shaping up to be the grand experiment on how far this craziness will be allowed to continue – valuable for future crazinesses that will crop up. Too bad they didn’t ask a chemist. Buzz , No , it means that so called “green” technologies are failing and will die without government intervention . At the moment , it looks like the American People are losing their stomach for subsidizing failing enterprises . BTW , if you’re the Buzz I think you are , there’s a market for Buchanan Co coal abroad . Linking Gary Hladik and Dr Burns above – surely Australia is THE place to do a genuine green carbon capture scheme. Aus is pretty well a desert that, as I understand used to be covered in forest. Also, it is quite sunny there and generally the Southern Hemisphere is quite windy. So, plant a few wind turbines & sunshine cells and use them to desalinate a bit of water and pump it inland. If Australia went green (again), how much carbon would be stored there? Something that must surely be preferable to using ever more energy to push CO2 underground from where its got nothing else to but escape again – who is going to list all man’s inventions/contraptions/great ideas that have NOT failed. It would be laughable, if one didn’t have to weep at the vast amounts of money which have been wasted on pipe-dreams such as this. And the waste continues, unabated. Thank God! Another small stake through the heart of this zombie that won’t quite die that is AGW. Let’s hope this miserable sumbitch dies a horrible death once and for all. ” In the Gulf of Mexico, BP’s Carbon Capture Technology failed & OIL SPILL DUMPED MILLIONS OF TONS & damaged the Environment. More over CO2 is NOT CHANGING THE CLIMATE. co2 is not our enemy! No, coal is still very useful without “carbon capture” and there are plenty of people smart enough to know that. A lot of them speak Chinese or Hindi. Mange takk Norge. Det er aldri for sent til å være fornuftig. I think that’s a great point and that pops into my head every time someone says think of the children/grandchildren. CCS ain’t dead in Illinois. “A leading agriculture company is about to put the United States on the map with the world’s biggest carbon sequestration projects. The overall cost of ADM’s project is $207.5 million, with most of that — $141 million — supplied by the Department of Energy as part of President Obama’s 2009 economic stimulus package. As an Illinois resident, I must say, I have not yet been “stimulated”. As Gary Hladik points out, the plant world figured this carbon capture thing out aeons ago so eco loony policies such as this shove it back underground stuff are the product of minds that can be clearly seen to be dumber than the weeds. Hmmm….you have a point. Collecting the CO2 in Norway…ship it to Australia, and let it out. That would take care of the desert! I must admit I am feeling some schadenfreude at their loss. It was a frivolous waste of resources with no tangible benefit. I am delighted their scheme has failed. It wouldn’t have done much beside just pandering to the paranoid and giving justification to the looniest activists. Ursus Augustus: “… minds that can be clearly seen to be dumber than the weeds” are not responsive to ridicule. In the immortal words of Liberace they’ll cry all the way to the bank. The president of World Bank and JP Morgan Chase Bank and ALL the stockholders followed by several other banks…. Do not forget Tony Blair and the rest of the Politicians too. Then you can start on the universities and the mass media….. Initially grow a bit of grass, let it turn into scrub and henceforth forest. How long before it makes its own ‘forest climate island’ (UHI in reverse) and becomes self sustaining. Maybe use a wind mill or 2 to fix a bit of nitrogen for fertilizer to speed things up a bit…..
Use the politicians for fertilizer and the University types on treadmills to provide reliable energy for when the solar cells/windmills fall. That’s a nice chunk of joined-up thinking Pete. Unfortunately there is no way that some greedy parasite would be able to use your scheme to tap into a large stream of Taxpayer-funded largesse. Therefore it will never get off the ground. Plans in Germany to test underground carbon dioxide storage to combat global warming have been blocked by the country’s upper legislative chamber. The Bundesrat, which represents the 16 federal states, rejected a bill on Friday that had already been passed by the German parliament, the Bundestag, in August. The law would have allowed testing for carbon capture and storage (CCS) technology at former gas storage facilities. The federal government wanted to put the technology to the test until 2017 in two or three locations, with a maximum capacity of three million tons of CO2 a year. Critics point out that carbon dioxide is toxic in high concentrations, arguing that the escape of gas from underground storage facilities cannot be ruled out. In recent years several attempts at an agreement between the federal and state governments have failed. Storage sites require specific geological conditions found mainly in the German states of Lower Saxony and Schleswig-Holstein, where there have been violent protests against the technology. Perhaps with a Polar Bear climbing the hill behind him? Ah, if I only had Josh’s talent. Politician’s will never get punished for their stupid plans. They always fall back on, “We were doing it to save the planet” or some other such thing and then they seem to always get away with their schemes. Most of their schemes seem to have money as a goal whether for themselves or their friends and cronies. When ever something like this comes crashing down , as it always was going to , its worth remembering that when you spend a lot a money someone , somewhere got a lot of money so someone is at least happy. No, Gary, that is a short-term, temporary arrangement. There are very few wood homes 400+ years old. The vast majority have rotted, burned, been eaten by termites. Carbon sequestration needs to last forever. So far, there has been no single, viable, large scale, long term (1,000 year plus) man-made carbon dioxide mitigation scheme proposed, with the standout exception of nuclear power expansion. Good citizens should follow the increasing failures of companies and methods for mitigation and sequestration and resolve not to become carpetbaggers to take cash from schemes based on fraudulent designs. “Miller has spent the past four years pushing plans to build the 400-megawatt Texas Clean Energy Project in Odessa, not far from the New Mexico border. When completed, TCEP will be the cleanest coal-fueled power plant in Texas. In an era where cancellations of CCS projects in the US are outnumbering successful start-ups, TCEP has come a long way. Despite the bitterly polarised politics around energy, Summit’s $2.4-billion project won bi-partisan support in Texas’ state-house. Its secret? Summit’s process offers something to supporters of both green energy and fossil fuels. It captures and reuses CO2 emissions, which pleases the Greens, and it sells the CO2 to the oil industry, which boosts oil recovery from ageing wells. In December, TCEP was granted an air permit with no opposition. Summit was awarded $450 million from the DOE to scale up this process. You take the coal, you make a syngas. Then, with the gas, you make multiple products. You burn the gas to make electricity, but you also take quite a bit of the syngas and make urea fertiliser. So you have a separate manufacturing facility on the site next to your power generation. The process also removes almost all of the bad sulphur. And we’re using a low sulphur coal to start with. We capture more than 99 per cent of the sulphur and put that into a separate manufacturing facility on the site to make sulphuric acid, which is also sold. Sulphuric acid is used in the farming community and by industry. The best place for carbon sequestration is in the atmosphere. Unfortunately the diatoms and corals etc. have been turning it into limestone for eons. So it’s best to take that rock, heat with coal furnaces to release the trapped CO2 and make concrete, and build nice Dome Homes with it. Norway is also challenging the UK regarding their ambitious renewable policy. The Norwegian government is Statiol’s biggest owner.with about 80% of the shares…..
Agree totally with you Gary. If anyone does believe that CO2 needs removing from the atmosphere, then this is the way to do it. Of course the trees can be left to grow and capture even more carbon, but trees don’t make the same political statements as windmills and pointless grandiose carbon capture schemes. The best place for carbon sequestration is in the atmos….above. help even more. So spend nothing on CCS..! So, Nature basically ‘mooned’ the project. When it crashed, viola: A Mooned CCS Landing. Another massive waste of taxpayer money, another set of execs make a profit, and another Green project goes bust. i’ve got an absolutely brilliant plan for sequestering CO2. liquify it, load it onto rockets and launch them into space…. ADM must have been obama campaign contributors like Solyndra were. Clearly the blame lies with the trees. Lucy, the company went bust because the UK Government removed the green subsidies. So it was the UK that finally realised that the cost was too high. That norwegian company was more than happy to be on the receiving end…..
And that is the lesson about subsidies and protectionism; A few chosen (Aker Clean Carbon) gets a lot of money which many (UK taxpayers) must pay for…. “The market for the company’s technology for capturing and storing CO2 is “dead” “. “Market” ? I think he meant “subsidies”. A free market would be much better; It would automatically be “sustainable” ……over time…. I doubt if anyone is happy. Al Gore, who made megabux doesn’t strike me as a “happy guy”. He seems rather bitter, I think. the issue of carbon leaching out seemes to be a problem in the american area that did try it. they canned it i remember. Today in Aus..once again r williams a 40yr abc radio national sinecurejob holder..ran a story on some UK trial costing millions in some uni there, raving it up. thought they just canned another one apart from the scottish one? recently as useless..
we have too many true believers in positions of some power and persuasion..not that many follow them, but they do have the ability to ruin economies and lives until we can remove then via voting. Every geologist I know tells me that co2 pumped underground under pressure will find a way to leak to the surface again. Of course, then its avaialble to be pumped underground again I guess. The trouble here is that CO2 is odourless heavy and tends to collect in low quiet places. If you live near one of these CCS facilities, don’t sleep in the basement, you might not awaken some day. This is no joke. Common & financial sense, is finally starting to penetrate the beaurocratic depth’s of some minds. In the UK, Logganet’s carbon capture’s been sunk. It seems that £1billion was insufficient a bribe and the £1.5billion asked for, was too much for even the Huhnatic to stomach. The feed-in tarrifs for solar pv is to be halved, for installations completed after 12th December. The companies who sell these, like the ones who’ve advertised free supply & install contracts, where they get to “keep” the electricity generated over & above that consumed by the household, are up in arms about it and so are those who’ve not got their systems. I point you towards the wonderful Jo Abbess. Bugger saving the planet, give me the money! OK, so the oil drillers are ALREADY BUYING sequestered CO2 from, as someone else pointed out, Linde or Air Products or the like. Since Summit is selling into an existing market, their wonderful CCS plant results in precisely ZERO net CO2 reduction. Once the CO2 oil drilling market is saturated, the price falls and the economics and any possible CO2 reductions are out the window. It is similar to the concept (but opposite in result) of using waste vegetable oil to power diesels – it works until people actually start doing it in volume. Not to mention the siting issues with transporting coal to the plant, CO2 through “pipelines” to the oil fields, electricity through grids to consumers and urea, I suppose in tank cars. I can’t imagine many sites that make all four of these viable, especially if one supposes widespread use of the technology which would quickly saturate local markets. By the way, all of this wonderfulness is PROJECTED. No construction has started yet. It’s not dead Jim, I mean Alex. It just goes by a different name – OWS, ACORN (they have a new name now, too, btw) and the NEA, just to name a few. There, you see..? Anything is possible – given an infinite supply of money..!! Carbon capture efforts are just another form of crony capitalism. I’ll bet a lot of the money disappeared in the accelerated effort to “prove” carbon capture. What a great scam. Start companies that are expected to fail—wind, solar, carbon capture, or electric cars—and then they fail after having large piles of start up funds from the taxpayers. It’s nearly impossible to figure out where all of the money went. How does a electric car company such as Tesla burn through a million dollars a day when they are not even making car, just developing them? That’s insane. Somebody has a very large offshore account now. Klem is right. There have been fatalities in hotels where people have gone down into the beer cellar when there has been a leak in the gassing system for the beer on tap. The gas for the beer distribution system is a mix of nitrogen and CO2, and one can drown in it. Coca cola systems use pure CO2, I think. One can also run into trouble with nitrogen systems where they are used to fill transmission lines. Should be more canaries! Or, more seriously, use of blood oxygen sensors, which can work on a fingertip, and probably an ear lobe; prices have come down below $25. That’s a piss poor analogy. The US accomplished the mission it set out to do. Freud, Marx, and Darwin. Two down, one to go. Looks like we have to take a little detour through climate science first though. At risk of insulting your intelligence, I offer the following. President Obama is a product of the corrupt politics entrenched in the state of Illinois. “In light of the recent jury verdict on the Blago trial, I got to thinking about the corrupt politicians. Of course the corruption emanates from Chicago, where our current President cut his teeth. All you people like to do is “talk” to each other…that’s obvious…! And accomplish nothing..! Top to bottom…same people..! Stop spending MONEY on CCS…!! We want more CO2 in the atmosphere. We want more CO2 in the atmos. The crops feed more people. Carbon Capture and Sequestration is dead because the EROEI < 1. Prime example of how when something is WRONG (or unscientific) at the outset…becomes a complete catastrophe of logic, wasted money, and wasted human resources…in the end. Pete in Cumbria UK. Actually Australia is classed as two thirds desert but that’s because of the expected annual rainfall. But the deserts or interior have always been subject to heavy down pours periodically, and then within one weeks, flowers start to form, seed and then die off. Frogs and amphibians who have laid hidden for years, wake up and breed. This means they have evolved like this over millions of years, like our eucalypti and some natives, need a roasting before germinating. Actually if you look at Australia, most habitations and cities are near rivers or on the ocean fronts. There are some huge pastorial areas up North bigger than England. As precipitation patterns are such that the further in land one goes from the sea the rain fall lessens generally. As far as tree cover, before the last ice age ended, Australia had less trees than it did later. Mind you they have cut lots down since. Also recall at the Top End, there are distinct dry and then wet seasons, from monsoons and cyclonic storms. Unfortunately trees need rain to grow until their roots find underground water supplies, and fresh water is and has been always at a premium in Oz. Particularly during an el Nino. And we do get snow too and frost. But that’s why Australia has most of its population living near the sea or along rivers. Like in other places in the world. We have artesian wells in the Centre, but they go thousands of feet underground, and when it is pumped out, you don’t need to heat it it’s bleedin’ hot already. We had a bore once in NSW on a small rural property, but raw it tasted like a mixture of Epsom salts and cod liver oil. Yuck. Full of lime and iron. Ok for stock and veggies. But the rainwater tanks were precious to us. Evolutionary theory is better supported than any scientific theory with the possible exception of quantum mechanics Dave. Your equation of Darwin with Freud, whose ideas were at least quasipseudoscientific — apart from the large fraction of balderdash — is very far off. Equation of Darwin with Marx is outright slanderous. Darwin advocated no revolution, called for no mass movements, and in fact ignored Marx’s attempts to open a collegial relationship. There have been no murderous “Darwinist” tyrannies, with none in the offing, and evolutionary theory has no particular political import. Darwin’s work — and Mendel’s — opened a wide road to a better life. Medicine owes everything to evolutionary theory. Why do you think, for one tiny example, there’s objective justification for a mouse model of human disease? And guess why it works. In fact, without evolutionary theory, there would be no objective reason to think that a treatment effective in curing any one person’s disease would help anyone else. No babies with the bathwater, please. Interesting to read a post claiming the electric portion of a coal ->syngas plant is the least profitable. Good argument for the coming replacement of coal with Low Energy Nuclear Reaction appliances. It’ll take a while to get the cost down to coal’s nominal $.07/kWh but eventually end user costs will drop below $.01/kWh. Best part is it spells doom for CCS of any kind since pumping the plant fertilizer into the ground will not make oil more competitive with LENR. We can thank the United States Navy and the Naval Research Lab for pioneering this effective new energy technology that will put the AGW doomers to sleep — forever. We wonder though… Will Algore EVER apologize for trying to bamboozle us?? Anthony, there’s a major accounting error in the original post. Estimated costs for Scotland’s Longannet CCS project were of the order 1 – 1.5£Billion, not 13.5£Billion as stated. There are multiple sources confirming this. Sorry for a hasty translation. I translated the sum in Norwegian kroner into pounds for the first, but not the second sum. The idea of a reverse UHI in central Australia has been proposed, as long ago as 1938. The Bradfield scheme called for the diversion of rivers in far north Queensland inland, to the Thompson or Flinders Rivers, the resulting cyclone run off being directed inland and ultimately draining into Lake Eyre instead of being ‘wasted’out to sea. It might arguably work, but the cost even then was jaw slackening. It is imponderable to contemplate the cost of irrigating central Australia with desalinated sea water (the most expensive potable water you can buy) which is produced by intermittent wind and solar power (which are the most expensive electricity you can buy). An alternative means of inducing permanent climate change in central and southern Australia is to join the low lying Lake Eyre to Spencer Gulf,first considered in 1883, again at astronomical cost (it would require a 400km long, 1.5km wide canal, cut deep through Lake Torrens, and high volume pumping (owing to the limited hydraulic gradient) which would lead to a permanently filled Eyre Sea, increased precipitation and the end of dry northerly winds dehydrating the pastoral lands south. All flights of fancy, though the squander contemplated by the incumbent watermelon government in taxing thin air and then buying votes and funding more bird munchers might actually be sufficient – a rough (1986) estimate for the 1883 scheme was 10 billion (1986) dollars. The centre of Australia, mostly arid, was never a vast forest, you may be thinking of the Arabian peninsula or North Africa. Eastern-Central Australia was a shallow sea which separated the cratons of western Australia from the Great Dividing Range. One of the problems then of irrigating this is the shallow deposits of salt which are readily brought to surface with an elevated water table. Quite aside from getting enough water to storage without it all evaporating en route. As a mammal, I am in favour of oxygen. I also like more plant food.